Three years ago, whilst doing a tour of the South Island to visit herbal clinics and health shops, I fell in love with thyme. We were driving across from Queenstown and I noticed thyme growing wild along the side of the road. Being me I had to stop the van and have a closer look and in doing that realised the hills for miles and miles were actually covered in thyme. That sort of thing can nearly send me into a swoon. It was mid-winter but I could imagine the hills in summer, the thyme in flower, the scented air and the bees at work. I collected a little and I’m still using that same thyme in my kitchen. It has lost none of it’s flavour and is the sweetest thyme I have ever tasted. In fact I made a chilli con carne just last night for dinner and added a little. It was delicious. I struggle to grow thyme here with the heavy clay soils. The soil is too cold and waterlogged during winter. For me the answer is to grow thyme in containers. I harvest the flowering tops at the height of the summer when the active ingredients are at their strongest. Then I make a tincture which I use in my fungus salve. Interesting that the very thing that supports fungus conditions is the cold, dark and damp, highly intolerable to the thyme plant. By introducing the light and the warmth to our body, encapsulated in the thyme herbs totality we make fungus unwelcome and unable to thrive. These are the old ways of looking at plants and healing which we can learn through quiet observation. 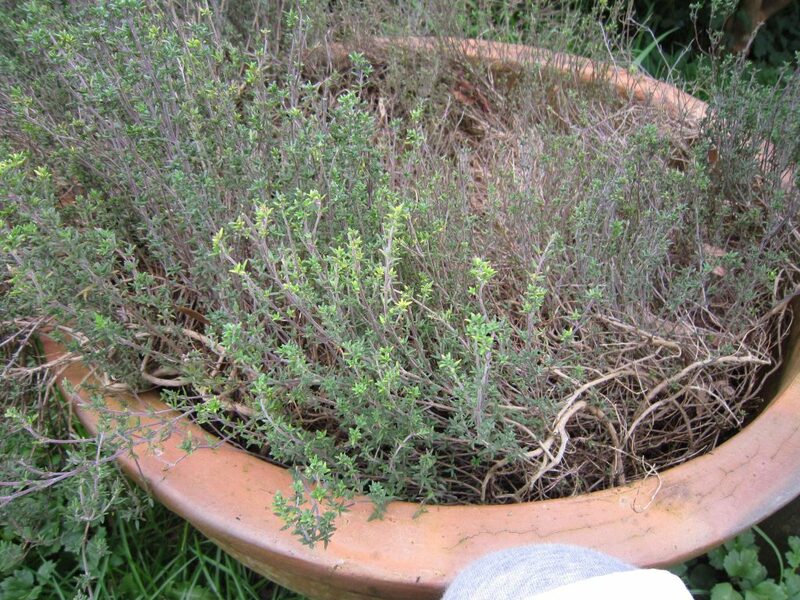 As you can see my thyme is looking pretty scraggly at the moment but we are at the end of winter. In a month or so I will give it a good cutting back and it will spring forth with new growth and cover itself in flowers. Description; thymus vulgaris is a small, bushy, perennial, herbaceous shrub. It has multiple stems growing from a? fibrous, woody root. The stems are branched, hard and usually reach no more than 8-12inches high. The small highly aromatic leaves are narrow and elliptical. Usually about 1/8th inch long and half as wide, the leaves are a soft greenish/grey in colour. The leaves are set in pairs on very short stalks. The pale purple flowers, typically labiate in appearance, are in whorls at the end of the branches.? Thymus vulgaris descends from thymus serpyllum. Today there is a huge number of cultivars to choose from when growing the plant for culinary or decorative purposes. Parts used; leaves, stems and flowering tops. Preparations; dried, fresh, tisane/teas, homeopathic, salves/ointments, tinctures/extracts, pills, formulations, capsules, cough syrups, lozenges, essential oil, honey, tooth-paste, soaps and mouth-washes. Habitat; native to the Mediterranean, north Africa and some parts of Asia. Now grown world-wide, naturalising where it can, thyme is a sun-loving plant that thrives in sandy (well-drained) and alkaline/ lime rich soil. Traditional & Historical uses; Wherever thyme has been grown it has been used as a culinary herb and digestive aid. The Ancient Egyptians used thyme when embalming their dead utilising it’s preservative properties. It was used as a fumigant by the Ancient Greeks against illness, and to clear the air in the home. In Athens thyme was grown to feed the bees and make thyme honey. The Romans used it to flavour cheeses, liquors and as a food preservative. Therapeutic actions; antiviral, antifungal (WHO, 1999, and Zambonelli et al, 2004), antibacterial, analgesic, antioxidant,preservative, anti-inflammatory, antispasmodic, expectorant, carminative, vermifuge, insect repellent, antitussive, aromatic, deodorant, depurative, digestive. Constituents; terpenoidic phenols; thymol, carvacrol. Monoterpene hydrocarbons; p-cymene, a-terpinene, sabinene, alpha-pinene, camphene, myrcene, limonene. Monoterpene eters; 1,8-cineole. Monoterpene alcohols; linalool, a-terpineol, geraniol, borneol. Monoterpene ketones; camphor. Sesquiterpene hydrocarbons; caryophyllene. Flavonoids; apigenin, luteolin, thymonin, naringenin. Labiatic acid, caffeic acid and tannins. Minerals; calcium, phosphorus, iron, magnesium, sodium, potassium and zinc. Medical uses; component of Vicks and Listerine mouthwash, cough lozenges, cough syrups. Current Herbal uses; Externally; as a gargle for laryngitis, tonsilitis, tooth-ache, sore throats and oral candida.? Used as a topical anti-fungal for fungus skin and toenails. The tincture in water as a douche for vaginal candida. Apply diluted esential oil for the treatment of scabies and lice. Thyme oil can be added to a base oil and used as a chest rub for chest infections and in a steam inhalation for coughs, bronchitis or asthma. Useful in a linament to help relieve muscle pain, thyme promotes blood circulation. For cuts, stings, sores, acne, rashes and burns. Internally; As a tonic for the immune system because of it’s antiseptic, anti-microbial and stimulating properties. In dyspepsia thyme stimulates the appetite, aids a sluggish digestion and improves liver function. Prescribed for intestinal worms and gastro-enteritis. The tannins are beneficial in the treatment of diarrhoea. As an expectorant, it is useful to make coughs more productive and its antispasmodic activities are helpful for asthma and bronchitis. Contra-indications; not to be used during pregnancy due to it’s emmenagogue effects. Thyme essential oil should not be ingested as it can cause severe poisoning. Gardening applications; thyme is a benefical herb whose prolific flowers will provide nectar for bees all summer. Food uses; When added to foods helps them to last longer. As a culinary herb thyme can be used in cooking with all meats and vegetables. It is one of the essential ingredients in the French bouquet garni, and a standard in stuffing for chicken. It can be used fresh or dried. This highly aromatic herb is used to flavour specialty vinegars, olives, pate and preserves. Imbibe thyme tea/tisane as a digestive aid or a healthy drink. Thyme honey is delicious in dressings or marinades. Naturally by Trisha products containing thyme; Fungus salve.